Huge Savings Item! Save 18% on the Vlando Viaggio Small Jewelry Case, Travel Accessory Storage Box by Vlando at Resha Laser. MPN: VJ-14037-GY-10. Hurry! Limited time offer. Offer valid only while supplies last. Vlando's Story VLANDO is an inspiring brand revived by Dutch designers with a long history of quality fine home and office products and solutions. VLANDO is an inspiring brand revived by Dutch designers with a long history of quality fine home and office products and solutions. VLANDO's name comes from a love story between a young leather product designer who madly fell in love with a beautiful girl called 'Lando'. Their first kid was named 'Verney', and the bond between designer, his love and offspring was established in the brand name "VLando". Today, we create renewed passion as VLANDO with an international design team to redefine how we daily store products, items and care for them. VLANDO is a color symbolized stylish life. Our mission is to bring our high quality, fashionable and practical products as well as passion for life to every home. Small in size, light in weight, fashionable in design and well-made in quality. Vlando believe people in all ages should not miss this jewelry case. It is an ideal travel jewelry box for short-term trip. 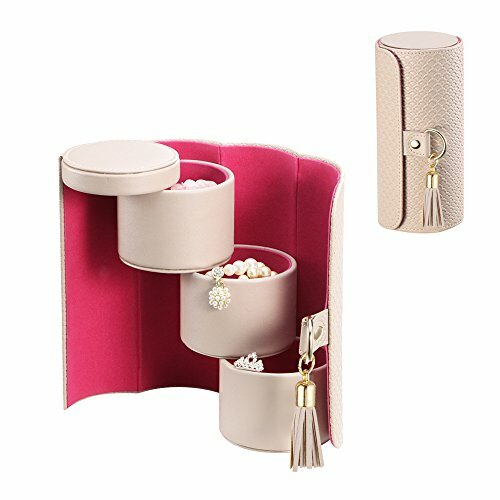 It is an idea jewelry box for anyone to get their daily jewelries organized before bedside both at home or hotel when outing. FUNCTION: Rolls up and closes with a snap button. Contains 3 compartments of equal size. If you have any questions about this product by Vlando, contact us by completing and submitting the form below. If you are looking for a specif part number, please include it with your message.